The final result of more than 2 years of extensive research and development, countless hours of FEA analysis, and more than 40 laminate revisions, the ZIPP SL handlebar is a re-invention of what you thought a performance handlebar could be. At 164g it is proof that Super-Lite does not have to be scary: The ZIPP SL has surpassed the most stringent test standards in the world. At the EFBe laboratories in Germany it sailed past the DIN+ standard and even surpassed a modified DIN+ test with an extra 50N added to all loads. The ZIPP SL handlebar is 31.8mm diameter at the stem clamp to 24.2mm diameter at the bends making for a very comfortable shape at the hands. The drop angle is 20 degrees (10 less than standard) in order to achieve higher brake lever position without having to tilt the bars upward. The dual radius bends in the drops allow for up to 15mm of brake lever reach by slightly moving the levers up or down. Dual cable routing grooves make for great feel with any system, and it will be offered in 40cm width as well as 42, 44 and 46cm wide bars too. 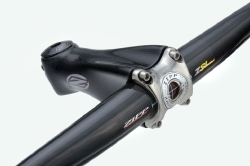 Weighing an astonishing light 160-166grams depending on width, the ZIPP SL handlebar is the stiffest bar available. Built for seriously powerful sprinters, climbers and track use, the ZIPP SL handlebar was to provide the ultimate bar for professional use or high performance road racing where every gram counts as much as stiffness and strength.